Sometimes I have a block of text, and need to choose from among the many available fonts. For example, making a birthday invitation. This macro takes less than 5 minutes to set up and run, and creates a table in Word with sample text in every installed font. You can then replace the text with the desired block of text to see it in all of the available fonts. 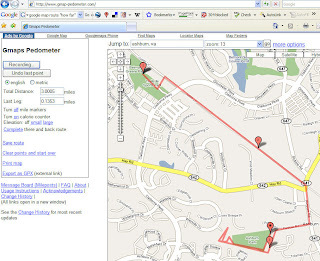 I found a great little tool tonight called Google Pedometer, which I've wished I had a few times recently. It lets you load a Google Map, start recording, and double click on any number of points in a route. Then it tells you the total distance of the route. This is great for those times that you take a long walk and then wonder afterward how far you went. Now I know that today on our trip to the zoo, I walked about 2.5 miles, and the day I walked from one playground to another in Ashburn, I went a little more than 3 miles (pictured below).